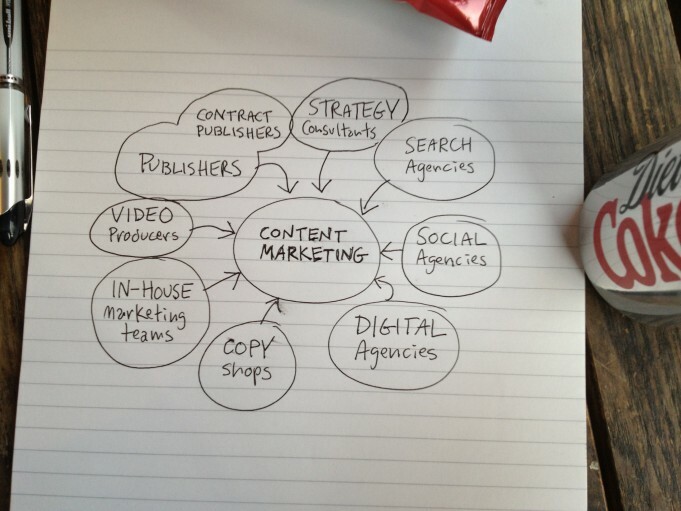 Is Anyone Out There Not a Content Marketer? Doug Kessler of Velocity Partners recently sat down with a can of Diet Coke and sketched out what we all suspected, below. The truth is that all great B2B marketing is converging on content marketing. As it shows, this includes, but is not limited to, people involved in publishing, video production, in-house marketing teams, copy shops, digital agencies, social agencies, search agencies, and — woot, woot — Web strategy consultants of all shapes, colors, and sizes. Certainly, the analytical skills of an SEO expert are different than the skills of the independent publisher, or the design or pacing skills of a video editor, but all can be utilized in a large, comprehensive content marketing plan. It can be overwhelming and confusing. As an unnamed author wrote at Heinz Marketing, “if you’ve been doing it for awhile and really aren’t seeing inbound leads or qualified sales pipeline production, you may be doing something wrong.” The piece provides some good tips to uncover why your content marketing is “not working,” but, strangely, omits the credibility step of revealing the author/journalist behind the post. The unbearable truth is that few companies can afford to, or even should, incorporate every medium and every associated tactic. Live blogging is great — except when no one reads your blog, for example. Where — with finite marketing budgets — can most businesses seek the best results for the limited dollars invested? The problem with easy is that what’s easy for you is easy for everyone else, too. If anyone can do it, a tactic quickly loses impact. You can’t build a lasting competitive advantage with easy. In fact, you might say his entire emphasis is that by offering more complex content (that is to say, including the involvement of more people and disciplines) will far outweigh content that can be “thrown together” by a single person in an echo chamber. This supports what we believe at SixEstate, too, with our emphasis on team-driven Newsblogging. Our process incorporates a range of disciplines to create and deliver what Meyers defends as “big content.” A daily blog filled with original reporting might look simple but in fact is difficult to execute by an individual blogger. Each part of our process leverages the talents of several people behind-the-scenes. Moreover, because a corporate blog works so well to drive search results, it does duty beyond the content marketing ethos of informing and educating your audience — it brings visitors and leads to your site. For this reason, a Newsblog is probably the most cost-efficient way to incorporate multiple professional disciplines and expertise in pursuit of your content marketing needs. Are multiple disciplines merging into content marketing? Yes. But appreciating the standalone strengths of those behind such efforts will reward businesses with the “big-content” competitive reward. Photo by Doug Kessler, Velocity Partners.